"My therapist uh, broke up with me… oh yeah, there's a Gnome Warlock in my living room sleeping on my couch." In 2009 LOTNA was introduced to a little geeky gem of a show called 'The Guild', written by Felicia Day about the social ineptitude of various types of gamers having to meet up in real life for the first time. As well as making us laugh it made some of us think, "Hey, that looks like fun." But instead of gaming and then having the awkwardness of meeting in real life we wanted to do it the other way around, we wanted to build a guild with friends. 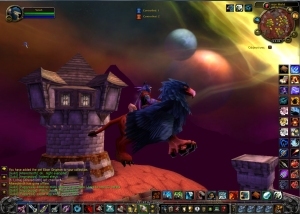 League of the Non-Aligned of Darkspear was formed. For us it's a social tool, a means by which we chat and keep in contact with each other while having fun running dungeons together or working towards guild achievements. We're not trying to be the best players in the world, just to enjoy the game and the time spent with friends. There's almost always people playing on any given night and everyone's more than happy to help new players with anything they want to do. We all have a range of characters at different levels which we enjoy role-playing, so there's no danger of being left behind. We try to do things together - that's why we're there, after all - and so have regularly scheduled dungeon runs, guild craft nights where we focus on building someone's skills in a profession, PvP battles, or quest nights. Anything we can think of doing as a team, we try to make sure everyone's included. For new players our only request is that we get to know you personally. We are first and foremost a real life sci-fi group with bi-monthly meetups in a pub, as well as various other geeky events going on all the time. We like to be able to put a face to the people we play with so they're real people and not just pixels. As we meet up in a pub this means all our members are over 18, which is nice for those who prefer mature gaming. 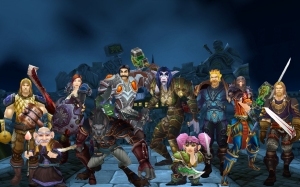 So if you've ever been interested in trying World of Warcraft but haven't wanted to game alone, we invite you to join in the fun of our guild of friends. Come down to a few LOTNA pub meets and get to know us, we're welcoming of all new members and will tell you all about what we get up to in the guild. 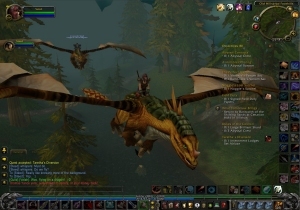 Discover a new world… of Warcraft.